Sliced italian sausage over a special blend of cheese over a tasty marinara base that is unique to Big G's. One of Big G's top sellers, our BBQ Steak 'N' French Fries is a jaw dropper. If you're hungry this pizza by the slice will certainly take care of that problem. Our Philly Cheesesteak Pizza is composed of philly steak meat, with our house made ranch, red and green peppers, and onions. This slice is so tasty that some our fans from Philly forget what the one back home tastes like, seriously. Mozzarella, Chorizo, Salsa Pico de Gallo, and Cheddar. This slice of pizza is made up of spicy chicken marinated in Valentina Hot Sauce, habanero, and jalapeño havarti cheese over a spicy marinara base. This pizza is only for the brave. Back To School Sloppy Joe's Pizza with your choice of onion rings or french fries, and Big G's special sauce. A one way ticket to pizza heaven. GET IT! One of Big G's favorite slices. Our alfredo sauce is made in house and our chicken is hand-breaded each day. We generally get a lot of "Mmm's" and "This is soo good!". We marinate our chicken in Frank's Hot Sauce and serve it on a Crème fraîche base. We top if off with some Gorgonzola bleu cheese and you enjoy every bite! It's a fairly simple process. Hawaiian Pizza - Oven Baked Honey Ham with Pineapple. Vegetarians can't get enough of our variety and selections of pizzas by the slice. Lasagna pasta over a marinara base, topped with asiago cheese. A 40 year old family recipe. New York style thin crust pizza with Chicago love and creativity. Apple Pie Pizza - Sliced caramelized apples, cinnamon, oats, and homemade frosting. Happy Birthday 'merica! Two Week Special (Jan 29 - Feb 10): Crab Meat, Green Shallots, Fried Won Ton Strips, Cream Cheese and Sweet 'n' Sour sauce. Special of the Week: Étouffée Base, Mozzarella Cheese from the San Joaquin Valley with a kiss of buffalo milk, Crawfish Sausage, and dollops of Marinara. Baby Spinach, Artichoke Hearts, Roasted Sweet Red Peppers, Red Onions, Kalamata Olives, Chopped Tomatoes, Parmesan, and Balsamic Vinegar. The most popular slice on our menu by far. We stand behind our product and firmly believe that our mac 'n' cheese pizza is the best in the city! Two Week Special (July 29th-August 11th): Mozzarella, Asiago, Gruyere, and Swiss cheese with a sprinkle of thyme. Big G's Pizza has numerous ethnic and global flavors, trying to incorporate organic and healthier options. No matter what time of day you will always find hot slices of pizza with the freshest ingredients and a variety of flavors that you will find yourself coming back to trying something new every time. From our signature slice Big G's Mac 'N' Cheese to our Guacamole Burrito pizza, there is no limitation to how creative we are with our pizza toppings. And for the less adventurous, don't worry, our menu also features delicious classics we all grew up enjoying. We are BYOB and we offer free Wi-Fi! We are within walking distance from Wrigley Field. 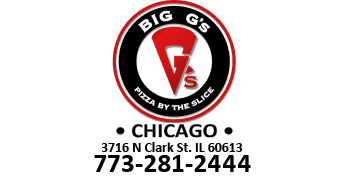 If you ever find yourself hungry after a Cubs game or in the Wrigleyville neighborhood stop in for one of our many delicious slices of pizza and meet our BIG G's Familia. We are conveniently located near the Addison-red (Red Line), Sheridan (Red Line), and Southport (Brown Line) transit stations.